This work site shows how more user friendly is being constructed around here now. 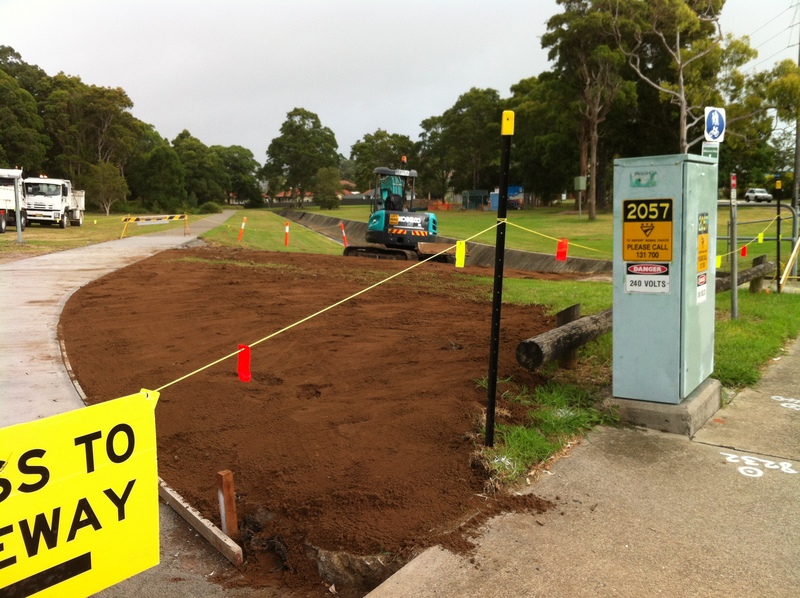 It is a picture, taken today, of the entrance point to Raspberry Gully bike path at Park Avenue. The path entry has been relocated and widened so it is much easier to ride there directly from the lights. Now there will be a gently curving ride once across the roadway, much easier to navigate, especially if there are a number of bikes riding there at once. This closer view of the worksite shows the location of the old path (which has now been removed), it is on the right of the picture, near the drain. The green coloured machine is on the former path site. So, formerly, to get to the path, you would cross at the lights (on Park Avenue), take a sharp turn right, then a sharp turn left a few metres later, and then you are on the path, which itself is wide and a very pleasant ride through the bush. Up until about a year ago, there was also a bollard at the entrance to the path, further adding to the navigation difficulties of entering onto it. Yesterday I saw a similar new treatment at an intersection on Turton Road, New Lambton. The intersection had been widened and the pathway had been made more intuitive to enter as well as widened. I wish I had taken a photo of it as it again shows how the city leaders are incorporating bike friendly treatments into new and existing infrastructure. Another pleasing aspect of this work in progress is that it appears to be taking place quite quickly AND a nearby alternative route has been provided for bikes, across the grass adjoining the worksite, meaning that this important commuter path has not been made inaccessible to cyclists while the work is taking place. In the past few years, when work was being done on part of this cycleway, in the adjoining Homemaker Centre, the path was cut off for 5 months while the new path was being constructed, and much longer than the 3 months allocated to it according to the signage. 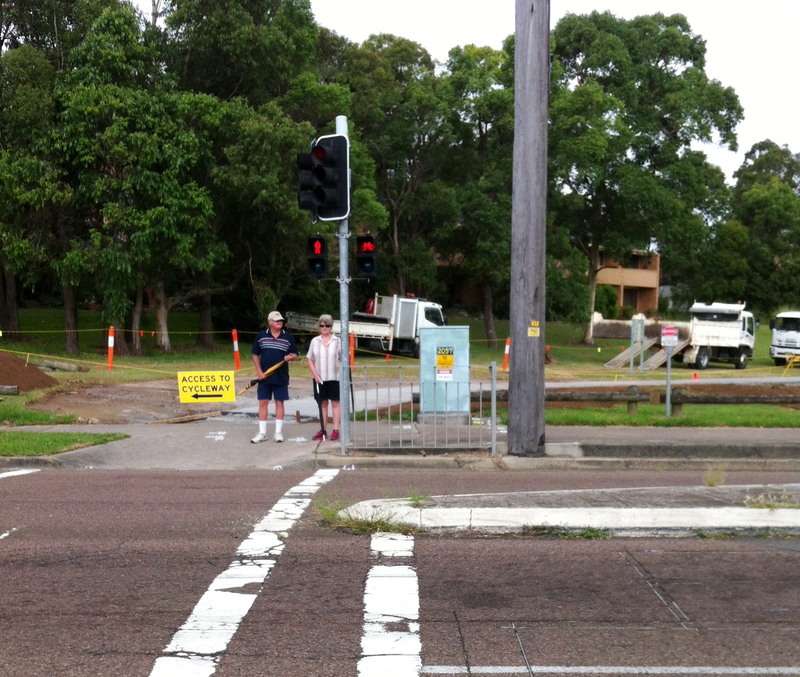 Similarly, along Throsby Creek (an even more important part of the cycleways) when work was done last year, it was cut off for many months, much longer than the timeframe indicated on the signage, forcing cyclists to take a much more inconvenient and lengthy detour through nearby streets. If these were roadway projects, such tardiness would not be well tolerated by motorists. It is great to see such projects taking the needs of cyclists into account for a future city which will hopefully see endless streams of cyclists making use of these cycleways, linking important destinations, as they go about their daily business. This entry was posted in Uncategorized and tagged infrastructure, newcastle bike tracks, Raspberry Gully, Throsby Creek. Bookmark the permalink. I ride on there every day. Dont know it has just been changed to this recently. It is very good.